It's necessary to use the arrangement tools to improve the layout of a flowchart when you have added a number of flowchart shapes to the flowchart and connected them. 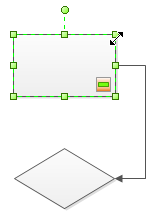 Edraw includes several arrangement tools to help you lay out flowchart shapes neatly and evenly. You might use different tools at different times while you create flowcharts. Some can make small adjustments to shape positions, and some help you rearrange the entire diagrams. 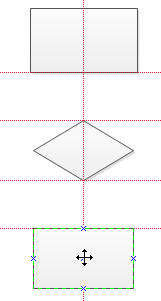 To select a single shape, use the pointer tool, then drag a square around the shapes to be moved. When you release the cursor, the selected shapes have green or blue handles. The one with the blue handles is the first to be selected, and is the considered the dominant shape when you align shapes. On the Home tab, in the Basic Tools group, click Select. Place the pointer above and to the left of the shapes that you want to select, and then drag to create a selection net around the shapes. After you select the shapes, you'll see blue selection handles around the shapes that you selected and magenta lines around the individual shapes. 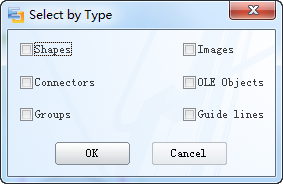 You can click the Select by Type button to select the type of shapes such as connectors, text block or basic shapes. Click a shape to select it. Drag a selection handle until the shape is in the size that you want. To resize the shape proportionally, drag a corner handle. Click a flowchart shape to select it, or select several as described below. Rest the pointer on one of the shapes. A four-headed arrow appears. 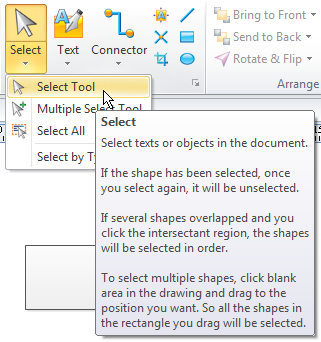 Hold the cursor over the selected shape, but not at an edge, drag the shape or group of shapes to the new position. The distribution guide line will show automatically. This tool is designed to leave your shapes as close as possible to their current positions, but aligned with each other and evenly spaced. When you move shapes, the connectors stay glued to them. However, their positions may not be appropriate any more. When you glue them dynamically, they move around to the most appropriate connection points. Select a connector by clicking it. Drag one end of the connector into the shape. 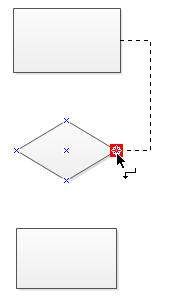 The entire shape gets a heavy red outline to indicate that it is connected dynamically. Repeat with the other end. Now see what happens when you move one of the boxes in relation to the others. When you add shapes to the flowchart and start changing their sizes and positions, they will inevitably become unaligned, which is very obvious when connectors are no longer straight lines. Instead of trying to keep shapes aligned by dragging them, you can do this more precisely using the aligning tools from the Tools menu. Select the shapes you want to align. On the Home tab, in the Arrange group, click Position. You can rotate shapes by degrees: flip them vertically, flip them horizontally, or rotate them using the rotation handle. Select the shapes that you want to rotate. Do one of the followings: To rotate the shape counterclockwise, on the Home tab, in the Arrange group, click Rotation & Flip; point to Rotate Shapes; and select Rotate Left 90. To rotate the shape clockwise, on the Home tab, in the Arrange group, click Position; point to Rotate Shapes; and select Rotate Right 90.